Is there going to be a development with Jerkface and Spensa in the next book? Their relationship will progress, but I won't tell you which direction. Is Allomancy a recessive or dominant gene? It doesn't work according to Physical genetics, it works according to Spiritual genetics, and they don't work exactly the same way. Are you going to make another Warbreaker book? Someday I will. It probably won't happen until after Stormlight 5 is out, because I want to keep those Stormlight books moving along. But once Stormlight 5 is out, Ill take a little breather from Stormlight before doing number six to do some things. Maybe like this. You've mentioned in the past aluminum savants being able to somewhat heal their spiritweb, healing them of the cracks, sort of healing them of Allomancy. Could a chromium savant do this to other people, kind of like in the Avatar [The Last Airbender] finale where he seals bending? I will say RAFO, but I will say you're theorizing along correct directions. Good question. No, she was not. Could you create a nuclear bomb using the Surge of Division? Not Division, but there are cosmere powers that are built around splitting atoms. Is Hoid's hair color naturally white? Now? Does he have a counterpart who has black hair somewhere? How would the city of Boston change over time in the Cognitive Realm, because its harbors have been constantly filled in with dirt? Right, right, right. It will change to match, but there will be a time lapse, right? They'll be lagging behind. So, you could dump it full of dirt, and then it might take like five or ten years before it actually appears as land. Yeah, that's exactly about how it would go. Could an analog computer be made using fabrials? Is [Hoid] ever actually what he's actually like in any of the books? I thought Way of Kings would be it, but I'm not sure. Wit is very similar to the real Hoid. He's worked a long time to build a place for himself where he can kinda be himself. I mean, when you see his book from his viewpoint, he'll feel very like Wit from Stormlight. You mentioned binge-watching a show, what shows do you like to binge-watch? Right now my wife and I are watching The Good Place. When in the books do you think is Hoid's most genuine moment? When Shallan hugs him... maybe. You get him out of sorts there. He doesn't quite know what to do. I don't know if that counts as genuine. He often would consider himself as being very genuine. But you rarely catch him with his guard down. With aluminum and Mistborn, I know that it makes the metals and stuff all go away, but if someone has toxic metal, would that also make it go away? It has to be Allomantically relevant. It could. It's very complicated, particularly with surgebinding, because the bond with the spren is a voluntary thing. So, you could steal the power, but you would also be stealing the sprenbond which the spren then has autonomy over. So, it might not turn out really well for you. It might not turn out well for anyone involved. Much easier to steal things where there isn't an autonomous being involved in your gaining of the magical powers. Does the M in M-bot actually stand for anything? He says it stands for Mushroom-bot. Spensa thinks it stands for Massacre-bot. Let's just say they have a difference of opinion on that. It's not going to get answered. She started calling him that and he was like, "Oh Mushroom-bot! Mushroom-bot sounds right!" Would animal bones work [for a skeletal]? Animal bones can work and have been used before. They don't like them as much for various reasons. They're worse at following certain commands. Does a Bloodsealer need to restamp the bones [of a skeletal] every twenty-four hours? They do need to maintain the seals in the same way, it's not necessarily every twenty-four hours. How does [Bloodsealing] actually work with [the skeletals]? Does it trap something inside the bones like a Command? Yeah, it works very similar to making Lifeless. Slight variations, but you are basically animating the bones by using Investiture that doesn't actually belong to them and tricking them into thinking that it does for a little bit of time and making it think it's alive again. And the fact that it's bones is really important for that, for Bloodsealing. But it's working in a similar way. The distinction is that with Lifeless you are actually using part of their own soul, right? And with Bloodsealing you're not. Does the Bloodseal have to be made with the blood of whoever it's sealing? Is there any requirement for how [a Bloodseal] is made, like location, like where the seal comes from? Yes, there is some tradition tied to it, and that tradition is steeped in fact, but not all the traditions are necessary, if that makes sense. So they have more baggage to it than it actually needs, but some of the baggage has... Like the type of bone you're using, where you get the bone, and the location, and stuff is relevant, but some of the other things they put on it are not and also, it's not one hundred percent necessary. So they think it might be necessary, but it's actually not? So does a Bloodseal have to be carved from bone? Doesn't have to be, but usually is for various reasons. Are there other colors of "Doomslugs"? If a female Smedry marries, will her husband and kids have Talents? Are we going to see Tacenda again, or will future stories all be about Davriel? I suspect you'll see both of them again some day. What is your favorite snack to eat while playing MtG? Maybe it's something that you cannot answer or confirm, but do you consider that the Raven man or the Chain veil are some kind of Entity? I came up with the Entities on my own, but I was aware of some of the similarities between this story and Liliana's story when writing it. I toyed with using some more direct connections, then decided to back out of them for various reasons. Is the Nameless Angel supposed to be the same one referenced in the official Magic story A Gaze Blank and Pitiless? If so, do you know if the story team is planning on addressing how she came back to life? You're speaking of the fourth sister, the WB one? The team asked me to RAFO this, meaning leave it ambiguous for now. Since you knew you were writing for Magic the Gathering, did you ever think about what kind of abilities a hypothetical Davriel planeswalker card (Spoilers: or Tacenda planeswalker card) would have? Davriel would, I hope, have the ability to exile a card from a player's hand, then at some point in the future play that card using black mana. Tacenda would be tougher. Emotional manipulation is hard to capture in MTG, other than as threaten effects. But I'd want something that could mimic this. I know you were instructed to not be as concerned with replicating game mechanics, but were there any particular cards or concepts that inspired you as you worked? Rage Thrower shows up in a quite obvious moment, and I imagine the dismissal spell that Davriel uses to be Silent Departure. (My interpretation of a blue unsummon effect, as opposed to an actual creature destroying spell.) There are a few other things, like the "summon equipment" spell he learns. Which orders of Knights Radiant do you think the main characters would best belong to? Hm. Let me think on that. I'm not sure if Davriel would fit into any of them, honestly, though Tacenda could fit several. What plane would you LEAST want to set a story on? Hmmm. You know, I hadn't even thought of that. I don't really think any of the settings are bad, and most are quite good. Probably something like the Arabian Nights plane, as I think there would be a lot of problems with trying to do a story like that--not the least of which being Wizards probably hating the idea. I understand that your novella will stand very well on its own, but I'm sure there will be references to existing lore. Could you point out any existing MtG novels that would particularly increase our understanding and enjoyment of some details in yours? You're right in that I don't have an official version; I haven't had Isaac take the time to do one yet. (I tend to keep him busy with loads of things.) I'd say these are very nice, and along the lines of what I was considering--but I don't have a full decision on what I want yet. We might have to wait a little longer for a canon answer, but I do think these are close to what I'll eventually want. I hope they do something like cycle the colors. Was kind of disappointed when they went with a different color for the second book. If they alternate blue/red though it would be cool. The colors were meant to match the Radiant order of each flashback character. The first three [Stormlight] books are a continuous narrative, but it's now looking like there will be an in-world gap between books 3 and 4, similar to the year that was skipped between each book in the Mistborn trilogy. Even with that, isn't the plan for SA for it to be two related five-book arcs with more of a major gap in between? Yep. Previously I thought that would be the only timeline gap, but Brandon has leaned more toward this new gap while writing Oathbringer. I'd be curious to hear your argument for that. Is it just that a true quantum multiverse would contain all possible iterations (even weird and wacky ones like Alcatraz and Rithmatist) or is there some underlying mechanical commonality we don't necessarily know about? It's only because the plans for this as-yet-unnamed multiverse all involve different versions of Earth in some type of crisis. And that description fits both The Rithmatist and the Alcatraz books. Brandon does plan some of these Earths to be pretty wacky. Since you mention its namelessness, will it actually get a name at some point? It would surprise me if it didn't get a name eventually. Had never heard about this, but this fits so well! Is this the first time you're confirming it? Or is there WoB on this as well? What I said above was that I have argued for this to be the case. It doesn't mean that Brandon agrees. I believe /u/peterahlstrom mentioned that Mistings can only detect sufficiently close versions of their metal, and burning non-Allomantic stuff is a Mistborn-only risk. I don't remember saying that, though it sounds reasonable. Except I don't know what happens when you start involving god metals. How important is the alloy percentage then? Shallan's comment in Words of Radiance that she's "five foot six inches" jerks me out of the story every time, particularly because I'm used to the metric system. I understand in my head how Sanderson is translating for the readers whatever Rosharan measures she actually used...but it's still jarring whenever I actually come across it while reading. Measuring by foot was extremely common in our world. Many European countries had their own standard foot. It just makes sense that humans would measure by feet. The Vorin foot probably has 10 inches. By the way, if all noble-era Allomancers got some fight training, does that mean a lot of Coinshots and Lurchers got really fat, so they had more weight for their pushes? Or would that be like, too blatant a clue that someone was an Allomancer? ... I'm now thinking of a scheme where a non-Allomancer noble member has to get super fat in a month so his house can bluff that they have more Coinshots than they do. Hah, good question. I don't think that's what happens. After all, many of them hide what they are in order to keep opponents guessing. If it were too obvious, that wouldn't work. Any significance to these symbols or do they only exist to look cool? Oh, from the old website design. 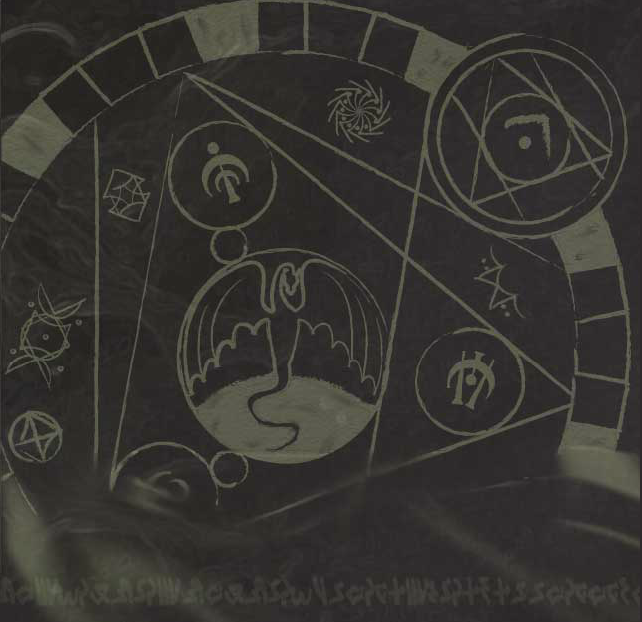 Jeff based them on things in the books, but the symbols are not canon. The question is, WHAT woman [is on the cover of Arcanum Unbounded]? It's Khriss, some years after White Sand. Perhaps around the time she wrote the planetary system essays that are included in the book. There was a dispute between /u/mistborn and /u/PeterAhlstrom, and last we have heard, the latter, claiming that Hoid was indeed somewhere in the Shadows for Silence, had the upper hand. Or they might be different mysterious worldhoppers than the one you're looking for. In Alloy of Law, Wayne says he read a book with talking rabbits, which is referenced again in Bands of Mourning. I'm all but certain this is a reference to Watership Down. In Bands of Mourning there's a bit where Wayne says he read a book where seven convicts stole a spaceship or something, and it's clearly a reference, but I'm not sure what it's a reference to. Does anyone know? Preliminary Google searches turned up only a TV show called Blake's 7, which seems unlikely to be the reference, since it's not actually a book. I believe you when you say that there are books about talking rabbits on Scadrial, but at one point in the Wax & Wayne books, they make a reference to talking rabbits, and then the word "fiver" is used. Fiver is one of the characters in Watership Down. Brandon is definitely using a play on words to reference a classic novel from our world.